A Quebec town near the epicentre of a 5.0-magnitude earthquake is calling for emergency help after tremors felled the steeple of its church and damaged several other buildings, including the town hall. Wednesday's quake badly damaged Gracefield's church and a local restaurant, Quebec provincial police reported. It also caused significant damage to a community centre and a hotel, Mayor Réal Rochon told RDI, the television news network for Société Radio-Canada, the French arm of the CBC. Police reported that no one was hurt. The temblor hit at 1:41 p.m. ET south of Echo Lake, Que., 60 kilometres north of Ottawa near the Ontario border, and was felt across southern and eastern Ontario and western Quebec, as well as in some U.S. states, including Michigan, Ohio, Pennsylvania, Vermont, New Jersey and New York. A section of Highway 307 collapsed into a river near Bowman, Que., as a result of the quake. ((CBC))Rochon has called for emergency help from nearby Maniwaki, Que. Gracefield is about 40 kilometres west of Echo Lake. Some local streets were closed to avoid injuries, and town employees were sent home for the day because they were so shaken up by the incident. Rochon said he was arriving at the municipal offices when the quake hit. Read stories about the earthquake and check out earthquake photos submitted by CBC readers. Do you have footage of the quake? Send us your photos and video. "I saw the employees in a panic, running out of the building," he said. "I personally called 911 to ask for help. It was terrible to see." 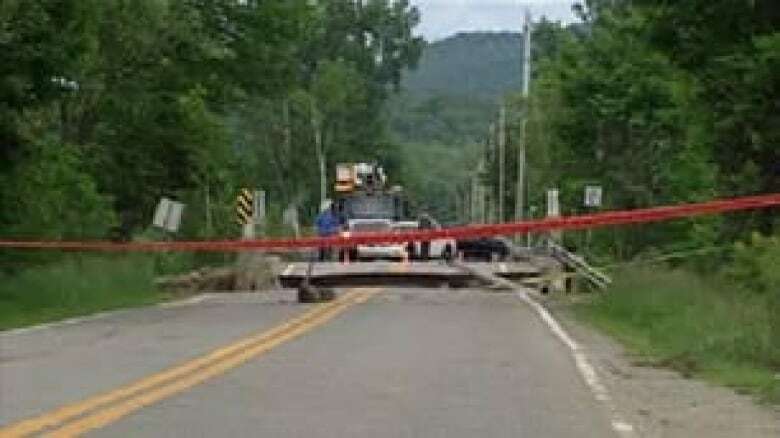 A section of Highway 307 near Bowman, Que., north of Ottawa, collapsed into a river as a result of the quake, shutting down that route. Quebec Transport Minister Julie Boulet said officials would be conducting inspections of infrastructure in the Outaouais region to make sure nothing else was damaged. "Be assured that we will be very, very vigorous about the quality and the security of our structures," Boulet told reporters in Quebec City. Buildings in Toronto and Ottawa were evacuated in the minutes following the tremors, and Ottawa's O-train was shut down until after 5 p.m. Eight schools run by the Ottawa-Carleton District School Board were being inspected by structural engineers Wednesday evening to determine if they need to be closed Thursday, after cracks appeared in the buildings as a result of the earthquake. As of 7 p.m., three had already passed inspection. The board said it will call parents if any of the schools are deemed unsafe. Thirty other Ottawa public schools suffered minor damage. Windows at Ottawa's city hall shattered, and a brick chimney came apart at the nearby solicitor's building, dropping bricks that fractured both inside the fireplace and outside the building. Employees on Parliament Hill were evacuated from buildings and sent home. Crews were inspecting main and satellite buildings to be sure they were safe. Prime Minister Stephen Harper said he did not feel the earthquake. The Ontario Provincial Police reported no injuries, but the Ottawa fire department said it was overwhelmed with false alarms. In Montreal, the Metropolitan Transport Agency briefly shut down four of its five commuter train lines as CN and Canadian Pacific inspected the tracks, but had reopened them before 5 p.m.
Johanna Wagstaffe, a CBC seismologist and meteorologist, said earthquakes in this part of Canada are rare, "but we do have them." 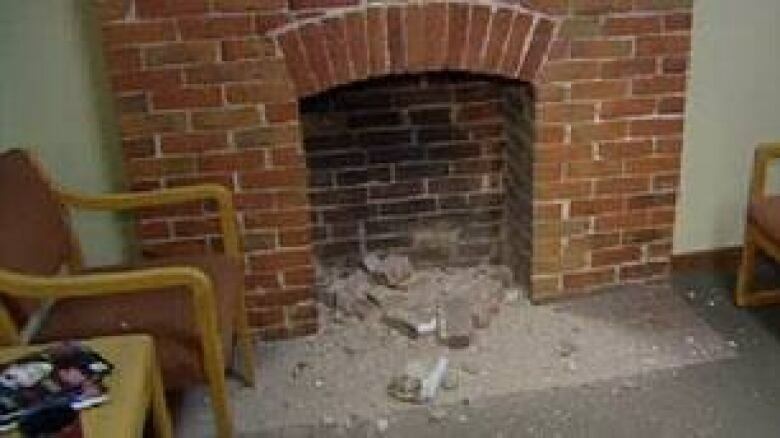 A brick chimney was damaged at a building near Ottawa City Hall. ((CBC))She said there are small fault lines along Lake Erie and Lake Ontario, as well as a relatively active fault line that runs parallel to the St. Lawrence Valley. The last comparable earthquake on that fault line was a 5.4-magnitude temblor in 1998, she said. 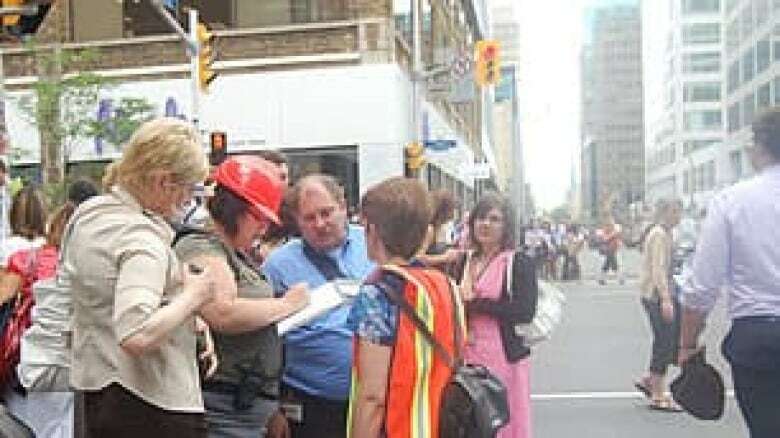 Janet Drysdale, a seismologist with the Geological Survey of Canada, said people should take precautions to protect themselves in the event of aftershocks, either by taking cover under a desk if the building is solidly constructed or leaving the building and getting a safe distance away if it is poorly constructed. She said that because the Ottawa area is in an earthquake zone, most of the buildings have been built to withstand this type of earthquake. Geneviève Blais lives on Hawk Lake, about five kilometres from the earthquake's epicentre in western Quebec. She said she and her husband were doing some work on the deck when they noticed the first tremor. "Thank God we weren't on a ladder," she told CBC News. "It felt like someone set off dynamite below us. Pictures fell from the walls and lamps got knocked off their pedestals." Blais said she still felt rumbling below the house at 2:40 p.m., nearly an hour after the earthquake was reported. "It sounds like thunder, but the electricity hasn't gone out," she said. Kathleen Sullivan was working on the eighth floor of an office in downtown Toronto when the quake hit. "It was very peculiar, because we could actually see the plants on our window shelf shaking. "By the time we gathered in the hall and figured out it wasn't our imagination, it stopped. But it was easily a minute of things shaking." 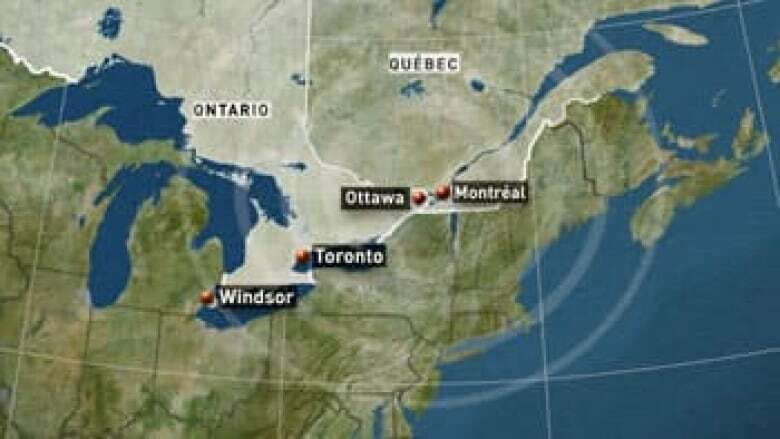 The quake was felt as far southwest as Windsor, Ont., along the Canada-U.S. border. "I was just laying in bed … and the bed just started to move side to side … just gently," said Darren Bonnici, who lives on the 10th floor of an apartment building along the city's riverfront. "Sort of, almost like a mother would rock a baby in a crib," said Bonnici, adding the feeling lasted for about five seconds. "I thought right away it must have been an earthquake." The earthquake was felt across Montreal and in the city's outer regions, including the Laurentians and the Chateauguay Valley. Marcel Maheux said he felt the ground move under his house in the Laurentians just after 1:45 p.m.
"It was big enough that my house and windows shook hard," said Maheux, who lives in Rivière-Rouge. "It lasted at least 15 seconds and it passed, but it was very, very strong." Hugh Maynard, who lives in Ormstown, southwest of Montreal, said his house was "rocking back and forth." Montreal police said no damage was reported to them.